The most important literary news from Hong Kong, Romania, Moldova, and the UK. It’s Friday and that means we are back with the latest literary news from around the world! From Hong Kong, Editor-at-Large Charlie Ng brings us the latest on theater, literary festivals, and poetry readings. MARGENTO brings us exciting news about past Asymptote-contributors and other brilliant writers from Romania and Moldova. Finally, our own assistant blog editor, Stefan Kielbasiewicz shares news about poetry in the UK. November is a month filled with vibrant literary performances and festivals in Hong Kong. On stage from late October to early November, a Cantonese version of The Father (Le Père) by French playwright, Florian Zeller, winner of the Molière Award for Best Play, is brought to Hong Kong audiences by the Hong Kong Repertory Theatre for the first time. The seventeenth Hong Kong International Literary Festival kicked off on November 3 with a grand dinner with Scotland’s well-loved crime fiction writer, Ian Rankin, who also attended two other sessions as a guest speaker: Mysterious Cities: the Perfect Crime Novel and 30 Years of Rebus with Ian Rankin. Carol Ann Duffy was another Scottish writer featured in this year’s Festival. The British Poet Laureate read her poetry with musician John Sampson’s music accompaniment on November 9. The dazzling Festival programme includes both international authors such as Hiromi Kawakami, Amy Tan, Min Jin Lee, Ruth Ware, Hideo Yokoyama, and local writers and translators such as Xu Xi, Louise Ho, Dung Kai-cheung, Nicholas Wong, Tammy Ho, and Chris Song. "You have as many countries as the languages you speak." 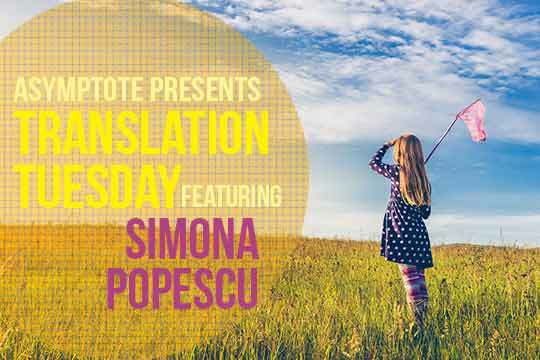 Today’s Translation Tuesday is brought to you by MARGENTO, Asymptote Editor-at-Large for Romania and Moldova. The lyrical excerpts from Romanian essayist and poet Simona Popescu’s writing explore a mood—memories of the nineties related as if at a remove, stating plainly what the narrator saw, while encapsulating the myriad complications simmering beneath the still surface of the narration. In the house of my childhood, somewhere in my parents’ mixed up bookcase, leaning on a couple of books stood a black teddy bear in a white sash ribbon with some red lettering on it saying Grüsse aus Berlin. On other shelves there were other “souvenirs” from Abroad. For instance, a wooden cylinder with a lid in the shape of a Russian church dome, with a rose and the word “Bulgaria” burnt onto it. Inside was a vial of Bulgarian rose perfume. My folks never traveled Abroad. In fact, nobody in our little town ever traveled Abroad. Not even the Saxons and the Hungarians who, judging by the language they spoke, had to have another country somewhere, if push came to shove, right? You have as many countries as the languages you speak, the saying went. The Hungarians and the Saxons were therefore half foreign. But even so, even they never got Abroad—it was only the old people that sometimes went, but they always returned. Nobody needed them and they didn’t need anybody or anything except a quiet life in their homes. Only old people returned. They and the migrating birds. Music, art and linguistics have been knocking on literature's door around the world this week. 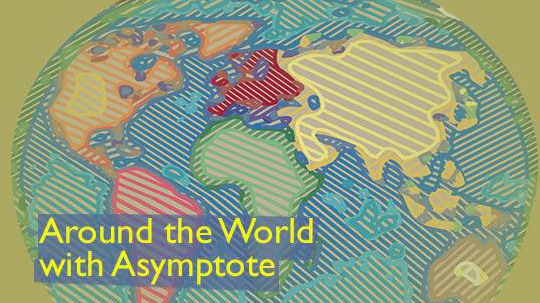 Asymptote members bring you the scoop. Literature is interdisciplinary by nature, and the world showed us how this week. From visual art exhibitions and a reading of the Universal Declaration of Human Rights in Hong Kong to a music festival infiltrated by writers in Slovakia and a commemoration of the late sociolinguist Jesús Tuson in Catalan, there is much to catch up on the literary world’s doings this week. Interdisciplinary collaboration has been a hot trend in the Hong Kong literary scene recently. Led and curated by visual artist Angela Su, Dark Fluid: a Science Fiction Experiment, is the latest collection of sci-fi short stories written by seven Hong Kong artists and writers. The book launch on September 2 took place at the base of Hong Kong arts organisation, “Things that Can Happen,” in Sham Shui Po. The experimental project was initiated as an artistic effort to reflect on recent social turmoils through scientific imagination and dystopian visions. The book launch also presented a dramatic audio adaptation of one of the stories, “Epidemic Investigation,” from the collection. On September 6, PEN Hong Kong hosted a bilingual reading session (Cantonese and English) as part of the International Literature Festival Berlin (ILB) at Art and Culture Outreach (ACO) in Wan Chai. About twelve Hong Kong writers, journalists, and academics participated in “The Worldwide Reading of the Universal Declaration of Human Rights” by reading excerpts of their choice from works that deal with issues of human rights.